I was looking for more counter space on my boat but had to choose between getting rid of the coffee maker or the toaster oven. In all honesty, I would make a pot of coffee and never drink the whole thing. I only really need one or two good cups of coffee in the morning. 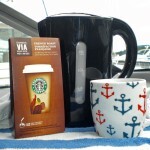 I decided to try the new Starbuck’s Via Instant Coffee available in 16 flavours including French Roast which I purchased. It is surprisingly good! The secret is to put the packet in your mug, add the water, wait 10 seconds and then stir. It is as good as my coffee maker ever churned out. So now I know you are thinking, “Where did she get the hot water?” I purchased an instant kettle from Superstore for $9.95, it boils water in under one minute. It has a much smaller footprint than the coffee maker and comes in black or white. It also works great to fill up the galley sink with hot water if you don’t feel like running the generator for a few dishes. 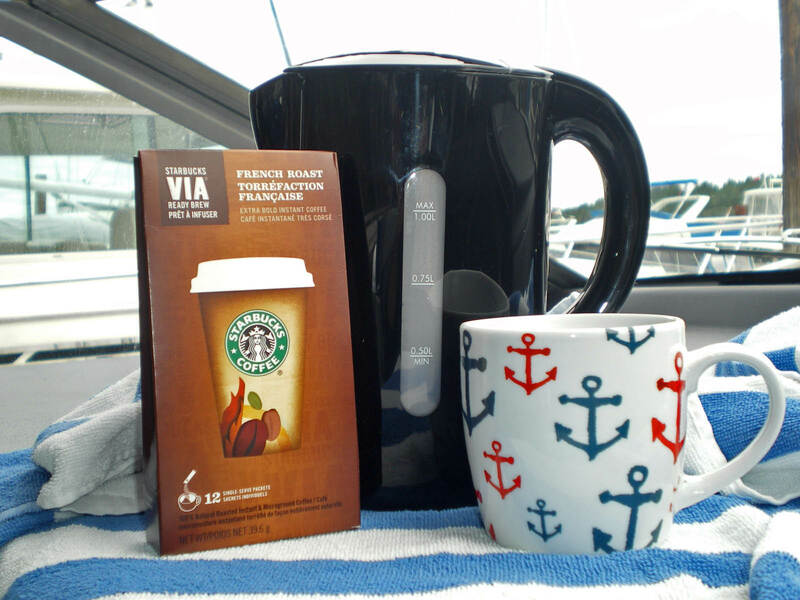 And the fancy boating mug? My mom found those for me at Capital Iron in Victoria.